For our clothing line, we source all our fabrics from a mill outside of Osaka, Japan. The mill has been weaving and making old school selvedge denim and linen for years. In the weaving process our mill uses almost no chemicals. Most of the processing is done through the use of soap and water allowing the natural material to go unaltered. This old school method increases our linen’s overall quality and longevity. We chose to work with linen because it is one of the most sustainable fibers to produce and one of the hardest working fabrics. Linen is 100% biodegradable and hypoallergenic. It is also created from flax plants which require very little water or maintenance to grow. 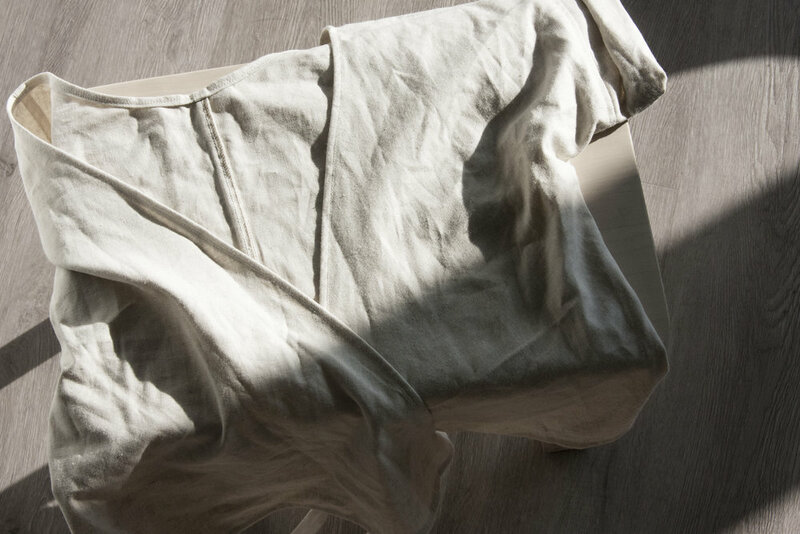 The small amount of cotton in our linen blend allows the fabric to have a softer feel, more matte finish, and helps to mediate the wrinkles that are often associated with linen. Hand or machine wash on gentle cycle with cold water. Tumble dry low or let air dry. We pre-wash all our clothing so it won’t change size as you wash and wear them. You also do not need to wash your linen garments as much as your other cotton clothing. Linen contains a resin called Lignin that not only soothes the skin but is anti-microbial eliminating perspiration and odors. That means you can wear your garment longer without sweat stains or any odors from use. Our fabric is made of 100% natural materials so it will become smoother and mold to your body overtime. Wear our linen rumbled for a natural look or smooth out with a medium hot iron for crisp clean lines. Be careful not to overheat your iron as the heat can break down the natural fibers causing them to become brittle.